Educating ourselves around politics, voting and how this affects us and others is one of the most important things we can do. Teaching our children about these topics even more so. Voting is the number one way that we as citizens can make a positive change in our country. Too many times, we hear groups of people upset about a decision made, policies and governments that are voted in but they themselves never went out and voted. People are unhappy but do not exercise their right to vote. So many times people feel powerless to make change but don’t exercise the number one way we can create change – voting. 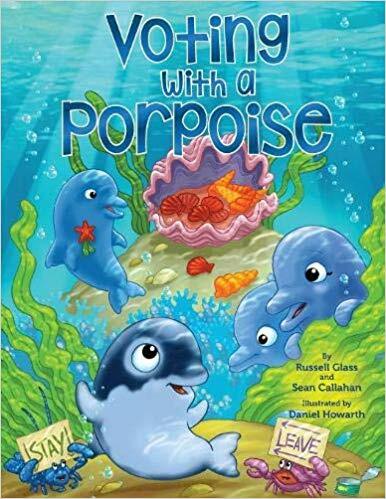 Voting With a Porpoise is a fun, easy to understand book for children to learn and ask actions about the voting process. In this story, a group of dolphins and a porpoise find their home can no longer sustain them, the fish have all gone away. They know they need to do something but aren’t sure what to do. One dolphin wants to be the leader and make the decision but a smart dolphin stands up and says no, that is not the way this is done. Instead she suggests all members regardless of whether they are a dolphin or porpoise (because you know that same dolphin that wanted to make the decision for everyone wasn’t going to want someone different looking making a decision) gets to vote on the future of the group. The group must move through the democratic process in order to come to a final decision that will save them. This is a sweet and to the point book that is great to get young minds (and some older ones) interested in voting and making a difference in their own home. We need to encourage and empower our youth to understand the process and that each vote and voice will make a difference. 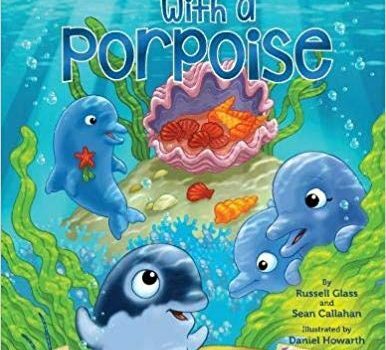 You can find more about this book on the Books with a Porpoise website and purchase a copy on Amazon. RUSSELL GLASS is a serial technology entrepreneur and author, having founded or held senior positions at five venture-backed technology companies and writing The Big Data-Driven Business. He is currently the CEO of Ginger.io, a company providing instant behavioral health support whenever and wherever needed. He sold his last company, Bizo, to LinkedIn where he ran the Marketing Solutions products group. Since leaving LinkedIn in 2017, Russ joined the board of Rock the Vote and has been focused on using his experience with technology, data science, and narrative/branding tactics to develop novel strategies to increase engagement and turnout among young voters. SEAN CALLAHAN is a content marketer at LinkedIn. He has written several previous books including The Big Data-Driven Business, The Leprechaun Who Lost His Rainbow, and A Wild Father’s Day. A former reporter, his freelance journalism has appeared in The New York Times, The Washington Post, and Notre Dame Magazine. He lives with his wife and two daughters in Chicago. He’s also a voter. Disclosure: I received the above mentioned book in order to facilitate this review. All opinions expressed are my own.